Beyond its natural beauty, clean streets and delicious food, the treatment we received by the Japanese people greatly surpassed all that we have received throughout our travels in Asia. 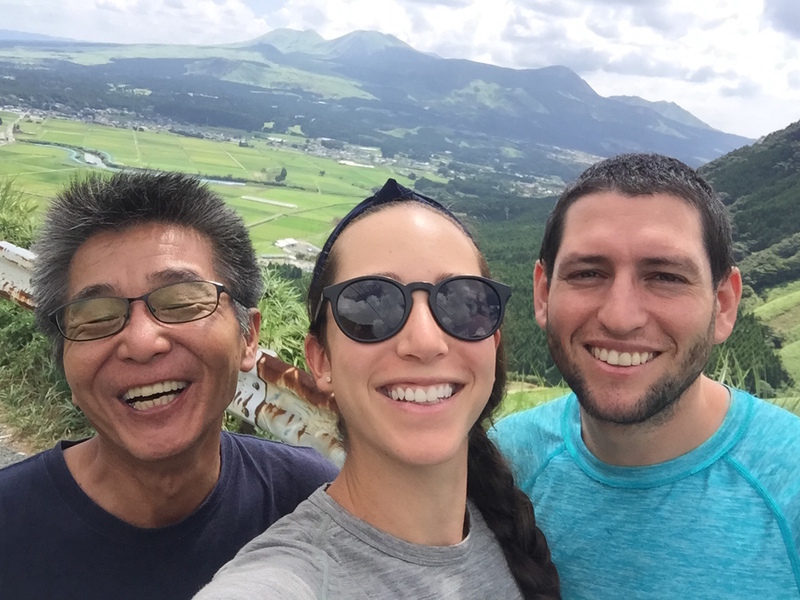 A month before getting here, I (Andres) started learning Japanese, and since people in Japan rarely know how to speak English, it allowed us to get by and connect with people more deeply. Japan doesn’t always make it on travelers’ lists because of its reputation for ruining budgets. Hitchhiking, besides being free, is a sure way to collect memorable stories. And after over 750 miles of hitchhiking, we have some amazing ones! With our destination sign in Japanese and the many people who gave us rides. That moment when you realize a car is pulling over for you is an indescribable feeling. You’re standing on a quiet road in rural Japan, surrounded by rice fields and rain looming in the distance. Holding a sign in Japanese written by the random person you asked for help, with the name of a destination that some blog declared as a good place to pitch a tent. Wondering if you will find food for dinner that night. The feeling of anxiousness is both exciting and terrifying. So when someone does stop for you, there are 10 exhilarating seconds where any other worry in your life temporarily vanishes. 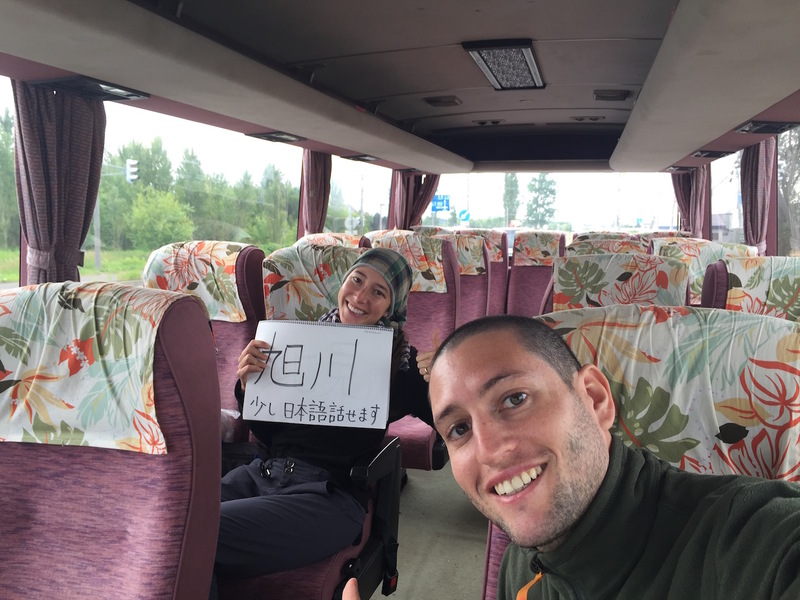 One of our most meaningful hitchhiking stories happened in the southern town of Aso. Standing by a 7-11 near a small road, we got picked up by a man called Takanoshi. 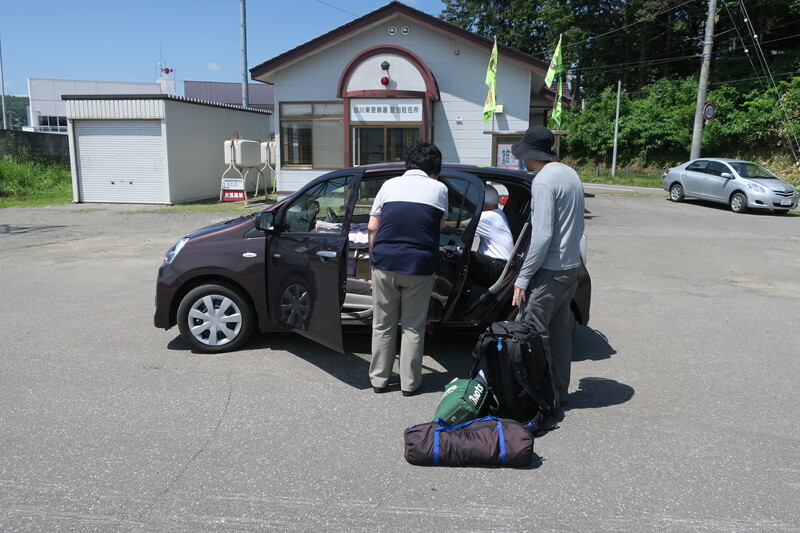 He offered to drive us towards his home town Kumamoto, a 1.5 hr ride. From there we would catch another ride towards Itoshima, our final destination, which was about 2.5 hours from Kumamoto. 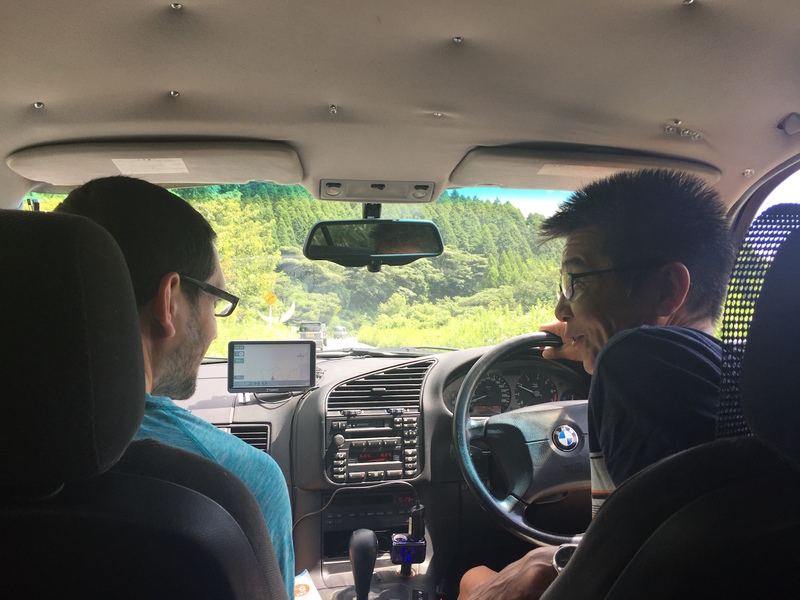 After about 10 minutes on the road, we noticed that Taka was taking a very strange way towards Kumamoto. We started getting concerned, why is this stranger driving us in a different direction? But when we questioned him the only explanation he gave was the word “Faster”. This made no sense as it was clearly a longer way with more traffic. It was when he stopped at a viewpoint up in the mountain that we understood what he was doing. This guy was willing to drive further just so we could take good pictures of the Aso volcano. The next surprise came when we stopped for gas. He went in the store and came back with a big smile, holding two plates of delicious buckwheat soba noodles and announcing: Lanchi! (Lunch in Japanese). We could not believe the man just bought lunch for us, the two strangers he had picked up from the 7-11 parking lot! Not only did he pay, he made sure we slurped our noodles as loud as possible, like true Japanese folk. The “Tale of Taka” doesn’t end there. He ended up driving 5 extra hours just to take us, and even refused to let us pay for any of the $50 worth of tolls. 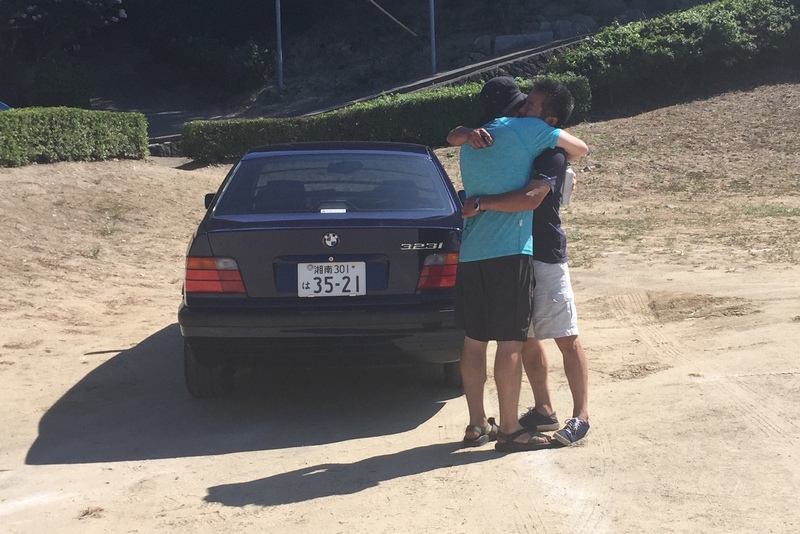 The final surprise came at the time to say goodbye to Taka, as we saw tears falling down his face. Not every hitchhiking story has a happy ending, like that one time a very nice woman picked us up. We were all laughing and having a lot of fun trying to communicate in Japanglish. Halfway through the trip, she suddenly pulled over and announced:“Bye bye, Go home now”. Scratching our heads in confusion and awkwardly thanking her for the half ride, we exited the car and watched as she drove away, abandoning us on the side of the road. We never learned why. Luckily most stories are more memorable like when we were again standing outside a convenience store in hopes of catching a ride. Suddenly a stranger appears out of nowhere, hands us 2 hot coffees, and walks away from us without saying a single word. We tried yelling “Domo Arigato Gozaimasu!” (thank you very much) and bowing to express our gratitude, to which the stranger briefly turned his head towards us, smiled and kept walking. 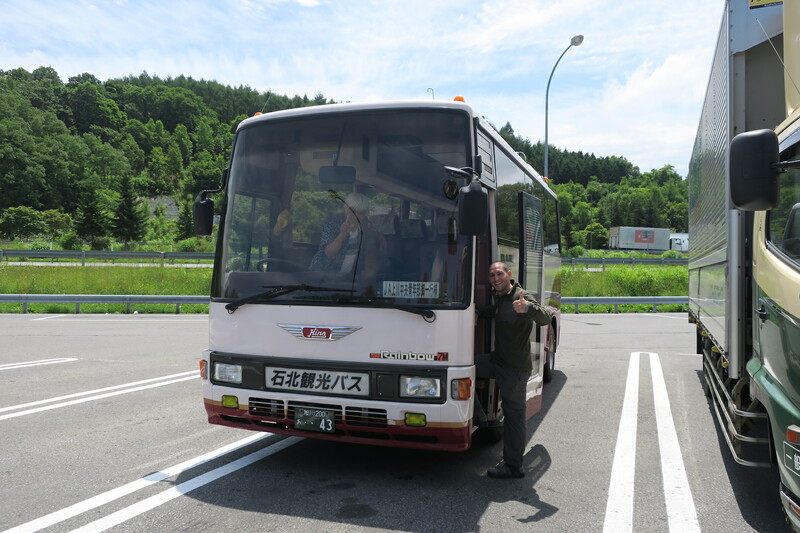 Anyways, his coffees must have been good luck because a few minutes later this sweet bus pulled over and we were on our way for the next 3 hours, comfortably stretched out in double seats through the beautiful Hokkaido scenery. Or that time after getting dropped off at a gas station, and within 15 seconds the next car had stopped for us. A tiny car full of random things driven by a woman in her 60s and a toothless man in his 80s sitting in the back seat. After much trial and error we managed to fit everything in, cramming next to Him, with our backpacks and tent piled up on top of us. A random (and weird) piece of info is that sitting so close to the 80 year old man, I (Andres) couldn’t help but notice that he had exceptionally good breath, seriously… no kidding. They stopped despite having a fully packed tiny car. 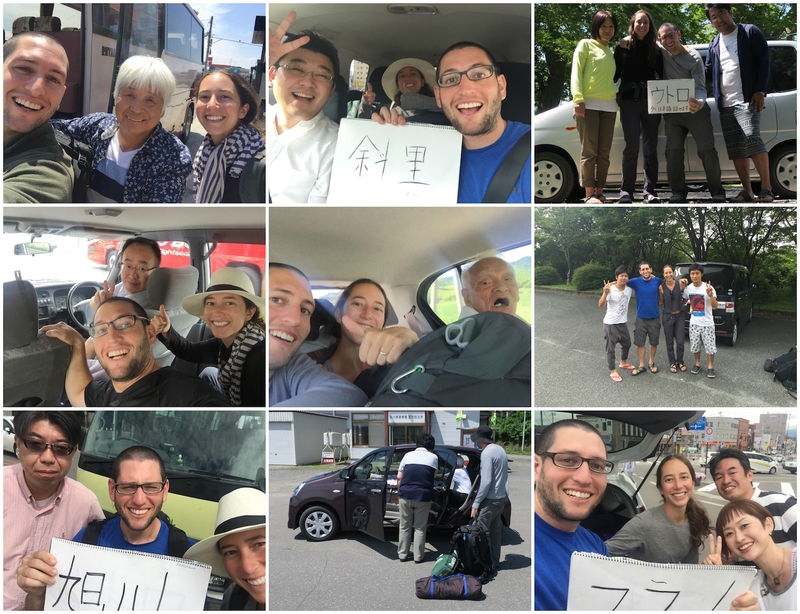 The amazing thing about Japan is that we experienced this kindness everywhere, not just hitchhiking. Once we noticed a group of 6 senior people at the mall staring at us. 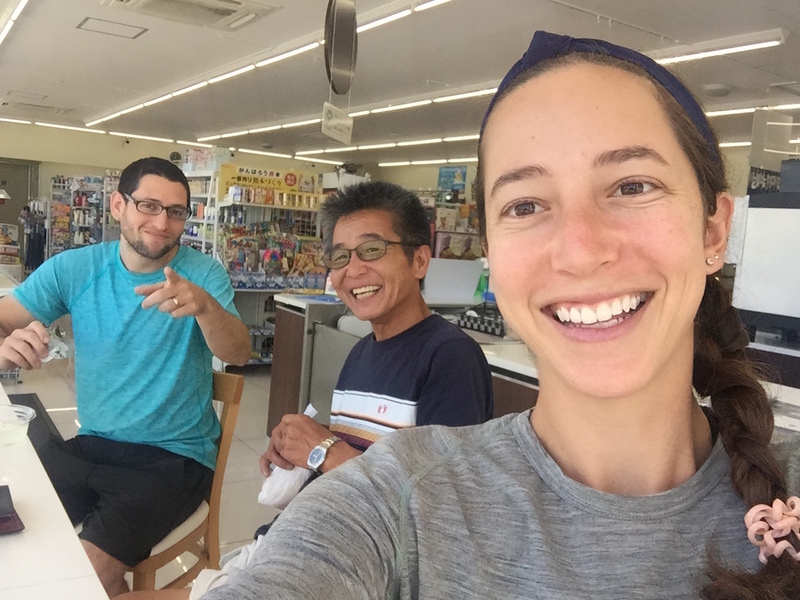 We approached them, and after a few minutes of embarrassing attempts to communicate in Japanese, they were buying beer and food for us! Or while walking the streets of Fukuoka, 3 salary men (office workers) in their 50s approached us and invited us to sing Karaoke with them, refusing at the end to let us pay for our portion of the bill (about $60). Also, one of them confessed that, before meeting us, he would run away from foreigners but that after meeting us, he was less scared! He even told Andres “I love you” when saying goodbye. 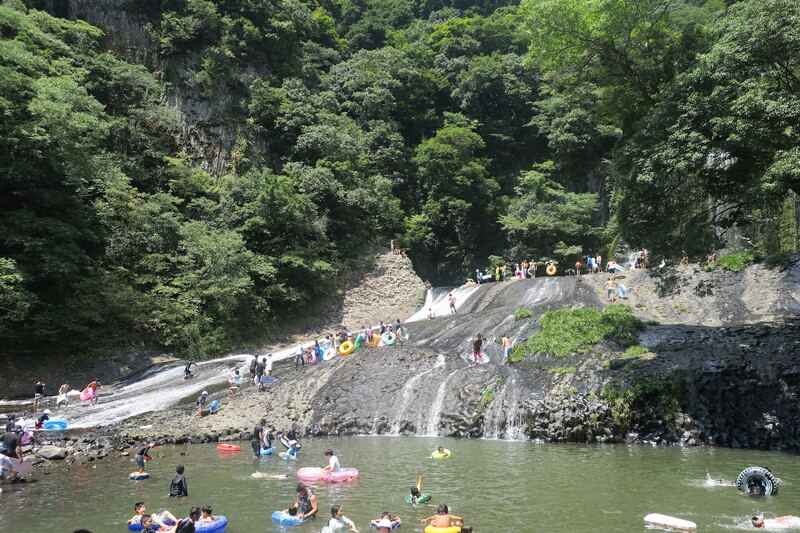 One time we were camping by this beautiful waterfall. 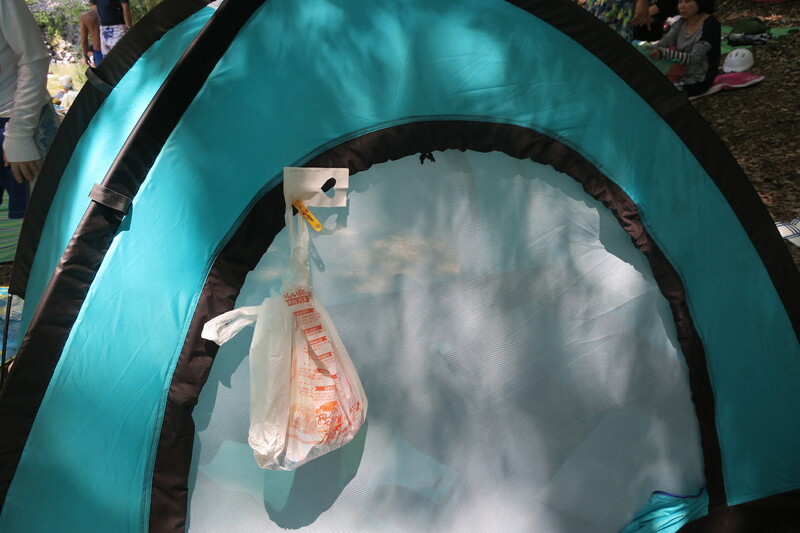 We went for a swim and when we came back, a bag of snacks with a note that read “A present for you” was hanging from our tent! Ok, would you pick up folks in Miami? I am always in a rush, and nay be also think is not safe….